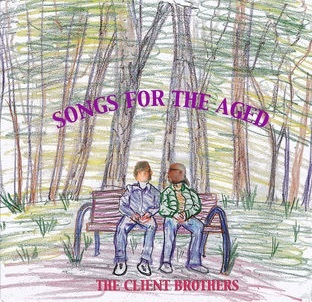 The Client Brothers – Songs for the Aged – Album Review | The Ark of Music – The best music in the world…you never knew existed. Composing and recording music together for almost 40 years—that’s four decades, kids—the multi-genre, multi-faceted duo known as, The Client Brothers, have made music their vocation. It all began long ago with soundtracks and commercial jingles; eventually expanding and evolving (as these things often do) into rock, jazz, electronica, new-age, hip-hop, and even comedy and spoken-word pieces. With roots in Minneapolis, Minnesota; Dominical, Costa Rica; and Tucson, Arizona; the album was recorded in all three locations, affording it just a touch of worldliness, which you just might notice. The playful and humorously poignant, What Did I Do With That Thing, pokes fun at exactly what the title suggests, providing a theme-song for the “where’s my keys” dance. With tuba and synth, dementia now too has its theme-song. If the world is ready to shine a humorous light on the condition, then, Why Am I Standing In This Room, is your jingle! A Man Walked Into A Bar: What happens when an 83-year-old man goes out on the town looking for easy love..? How’d you like to go to bed? Auto-tune and some heavily fuzzed-up electric guitar join a dark, retro-style, bluesy melody (which sounds like something off of a Quentin Tarantino film) on the album’s closer and most “serious(? )” track, She Never Said, a strange and twisted tale of desperate and unrequited love…perhaps. Either way, it’s a pretty cool tune. Never serious. Sincere in its self-deprecation. Funny as hell. The Client Brothers’ sixth studio album, Songs For The Aged, is one in a long line of projects which prove what indie-musician Chris Murphy said a while back, which is, “Forget the exaggerated reports of the music industry’s demise. It’s only the record industry, a relative blip in the history of putting tones in sequence, that’s suffering. Music, and the opportunity to make a life’s work out of it, well, that’s not going anywhere.” I offer this quote—in my humble opinion—as high praise for these two brothers who’ve found a way to squeeze their vocation into a niche in order to continue doing what they love—over the long haul. These five tracks, with their endearingly simple—though simultaneously maverick—style, offer a bit of humor and lightheartedness in an increasingly tense and emotionally-over-driven culture. This may—or may not—have been their intention. Nonetheless, it sparkles and grins at you for all of its twelve minutes. BELOW: Check out our full artist interview with The Client Brothers, listen to Songs for the Aged, connect with their social media platforms, and watch their music video. Please support The Client Brothers by visiting them online, and playing, downloading, and/or purchasing their music! And, as always, thank you for supporting real music!